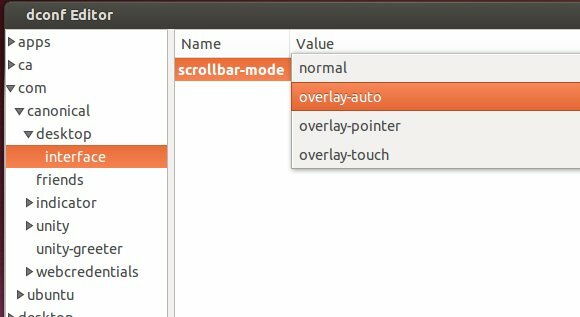 This quick tutorial is going to show you how to disable overlay scrollbars and switch back to old fat regular scrollbars in Ubuntu 13.10 Saucy Salamander. 1. Open Ubuntu Software Center. Search for and install dconf Editor. It’s much simpler to just open Unity tweak tool and disable them. @fatriff – Unity tweak tool only exists if you’re using Unity. In my case, I’m using mate-desktop. Tweak tool is gone, but scrollbars were still in overlay mode. Thanks for this quick solution. The command works perfekt. 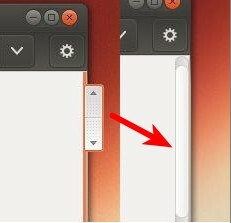 Now, however, the normal scrollbars lack the basic up and down button!! Is there a way to bring them back too? I also miss the page up and page down functions. If I click somewhere in the scrollbar, the position changes immediatelly to that point. I have no chance to scroll up/down pagewise with the mouse. In Firefox it is still working as expected, but neither on evince, nautilus and other utilities. thank you very much. It is very simple but nice article.